Home > Archive by Category "Ethics"
When a legal concern arises, hiring a lawyer may be the smartest option. Most lawyers meet with clients for an initial consultation. Initial consultations essentially serve as an opportunity to determine if you want to hire a specific attorney to handle your case and offer you legal advice. If it’s your first time meeting with a lawyer, you may not know what to expect and how things will work. It’s common for potential clients to be nervous or anxious when scheduling an initial consultation with an attorney. As a result, it can seriously benefit you to know what to expect when consulting with an attorney. What follows is a guide covering the basics of attorney-client consultations for the purpose of helping you navigate meetings and communications with your lawyer, or a lawyer that you are looking to hire. It will also discuss how to understand the fees and services that come with legal representation. 1. How do you prepare for your meeting with a lawyer? Being prepared for your meeting with a lawyer can help relieve tension and increase your general comfort about the upcoming meeting. It is also essential to focusing your meeting with a lawyer so that he or she can give you accurate and relevant advice regarding your claim or legal matter. To be best prepared for your meeting, you should gather all of the significant and relevant legal documents that relate to your case. If your lawyer has sent you forms to complete or requested certain documents, ensure they are accurate and completed to the best of your ability in advance and be sure to bring them with you to your meeting with a lawyer. It is common practice for attorneys to distribute client information sheets that need to be filled out before a client’s initial consultation. Completing paperwork, such as questionnaires and intake forms, helps your attorney narrow down what questions he or she will ask you, ensuring that your meeting time is spent productively. If you have received legal documents, either from the court or an opposing party to your case, it is important to bring these with you so that the attorney can review them and better understand your case. It is also recommended that you write down a brief timeline of the events. This can help refresh your memory before your meeting with a lawyer and set the foundation for you to think about what you would like the outcome of the case to be. Creating a timeline can also serve as a good reference point, or a checklist, for gathering all of the necessary documentation. Additionally, a timeline of the events surrounding your case is extremely useful to an attorney during and after your initial consultation. The process of creating a chronological order of events can help you, and your attorney, strengthen your legal arguments. Having a clear visual representation helps all parties involved in the case to have a better understanding of the sequence of events. You can also refer to your brief timeline of events to build a list of all the concerns and questions you may want to communicate during the meeting with your attorney. For example, you may be curious as to what kind of strategy the attorney is going to recommend for handling your legal matter or who else will have access to your case file and confidential information? It’s typically common to ask what the lawyer charges as a fee for his or her services. You may also want to get clarity on any additional costs that you may be expected to pay. Some attorney’s websites may provide information that can answer some basic questions that people commonly ask about the consultation or appointment process. While it may not be perfectly applicable to your situation, it can provide you with some basic legal vocabulary and an understanding as to different types of cases. You can also read about a firm’s attorneys–including things such as their educational and professional credentials. Asking questions about this information can being to cost you money if the lawyer explains it to you, but the tips and information on an attorney’s website are accessible at no charge. 2. What should you expect the meeting with your attorney to be like? First and foremost, it is important to remember that lawyers are people, too! They understand that it can be nerve-wracking to meet with an attorney for the first time–especially when the meeting involves disclosing private information and discussing sensitive matters. Keep in mind that lawyers are looking to help you with your legal issues and ultimately help you come to a resolution that satisfies you. Most initial consultations are scheduled for one hour, but the length of your actual appointment time may vary. The complexity of your case, and how much information you have prepared in advance, usually determines how long your appointment lasts. Your first meeting with an attorney is an opportunity to share your story and obtain a powerful tool–legal representation. While it is important to tell your story, it is also important to get comfortable with each other. It is strongly suggested that lawyers and clients attempt to build a relationship with open communication, honesty, and trust. In addition to some general “getting to know you” questions, the attorney will ask you questions that are designed to focus the discussion on the background facts of your case that he or she feels are relevant or significant. He or she will take time to understand your current situation, develop your case, and work with you to decide how to resolve your claim. Regardless of whether your legal issues involve a personal injury, criminal defense, divorce, or bankruptcy law issue, it is a client’s responsibility to be honest and as accurate as possible when relaying the events and facts of your case to your attorney. Honesty and full disclosure are always important when meeting with an attorney. Lawyer’s offices are safe environments where attorney-client privilege and confidentiality rules apply. Whatever you discuss during the your meeting with a lawyer stays private. If you have questions about attorney-privilege and client confidentiality, do not hesitate to ask your attorney to explain it to you. Failure, to be honest, can significantly impact your case–there’s even a chance that you may be unable to win your lawsuit. The outcome of the case could go unfavorable if any unanticipated information or evidence comes out. When your lawyer is fully aware of the facts of your case, he or she is able to best determine whether you have a valid claim, and then continue on to prepare strong arguments to support your case. It can be difficult to recall what was discussed during the meeting with an attorney. Even though you are meeting with him or her to share your story, your lawyer will have a lot of information to share with you in return; they will answer your questions, debunk legal myths, and offer peace of mind. Taking notes on important discussion topics during your consultation can help you remember key points from the conversation. For example, there may be follow-up information or paperwork that the lawyer asks you to acquire in order to proceed with your case. Everything the attorney says may feel important, but don’t feel the need to try to get everything down. It’s more important to listen to the lawyer’s advice and be able to ask any questions that may arise. If the lawyer determines that you have a valid legal claim, and is willing to take your case, it is likely that you will be presented with a retainer agreement. This will usually be presented to you at the end of your initial consultation. Your attorney should explain the terms of the retainer agreement to you and you should not sign it until you are sure that understand it. Basically, this agreement is a contract that stipulates your obligations to the attorney, as well as the attorney’s duties to you. Some of the duties that may be listed in a retainer agreement include: protocol for communicating with you about the status of your case, the approximate rate the attorney is charging you for his or her legal services, any payments that are required at the onset of representation, and the frequency in which you are expected to make payments. 3. What should you know about making payments to your lawyer? There are two ways that clients pay attorneys. The first way is called a “retainer,” where the client pays the attorney in advance for his or her legal services, and when the lawyer has worked for the full amount of the retainer, the client pays the attorney at their hourly rate. Retainers are most common in cases that don’t involve claims for money–usually criminal defense, divorce, and bankruptcy claims. It’s normal for lawyers with more practice experience to charge higher fees than newer attorneys. Sometimes, an attorney may be able to work out a payment plan so that you can make reasonable payments over time. If you are unable to afford the fees that your lawyer outlines in their contract, ask the attorney whether he or she is willing to come to an alternative agreement regarding fee payment. In cases like personal injury or workers’ compensation claims–cases seeking money–it is common for lawyers to stipulate to a set “contingency” fee in a “contingent fee arrangement.” When an attorney agrees to work on a contingency basis, he or she agrees to accept a fixed percentage of the amount recovered by the client. Percentages vary, sometimes depending on professional experience, but it is typical that attorneys working on a contingency fee basis be paid one-third (33%) of the amount recovered. 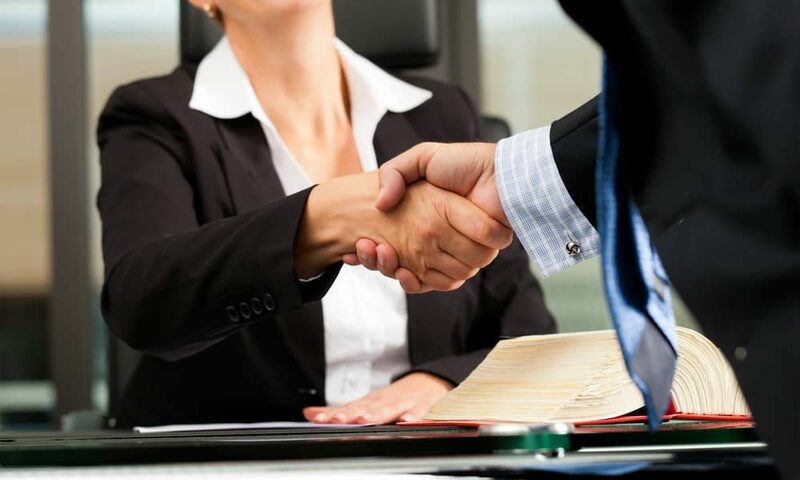 During your meeting with an attorney, he or she will explain that a contingent fee agreement means that if you lose, you don’t have to pay the lawyer for his legal representation. However, the lawyer’s services are different from filing fees and court costs. Regardless of the case outcome, clients are typically responsible for paying these additional expenses. At the close of your meeting with a lawyer, you should make sure that you have shared all the necessary information and raised all of your questions and concerns. Ideally, you should leave the consultation feeling comfortable with contacting your attorney, clear about the next steps in your case, and confident that your legal matter is in competent hands. Although meeting with a lawyer can be intimidating, being prepared and knowing what to expect can help you navigate the process successfully. If you ever find yourself in a legal dilemma, one of the first things that you have to do is to consult with a lawyer. A competent and experienced lawyer will be there not just to guide you through the complexities of the legal process, but to offer reassurance that your rights and interests will be protected. However, not all lawyers are the perfect fit. Some of them do not have your best interests in mind, while others will try to take advantage of the situation. Recognizing the red flags early on is the key to avoiding a lot of stress and heartache. Even when your case involves something as simple as filing a claim as a passenger, you need to be certain that your lawyer is above reproach. He has an overwhelming number of negative feedback on his website and other trusted review sites. He has a pending complaint or a history of disciplinary action with the state or local bar association. He has a low peer review rating, which is the average rating given by other lawyers based on various criteria such as legal ability and ethical standards. The lawyer you choose should have a concrete plan of action to help you win your case. For instance, if you are involved in a personal injury case, they should have a clear and definite step-by-step process that includes gathering evidence, obtaining medical documentation, calculating damages, filing a claim with the insurance company, and many others. If your lawyer does not have any plan, this is a big red flag. Every time you speak with your lawyer, he should be able to provide you with updates on what he has been doing since you last talked to him. He should also offer information about his next steps. Meeting deadlines is one of the first steps to ensure that your case will go smoothly. If your lawyer can’t even comply with a simple requirement like a due date, you should stay far away. When your lawyer fails to meet deadlines for things like filing an application or a response, it can be very damaging to your case. More importantly, there are some situations that require acting quickly. For instance, if you have been involved in a car accident, whether as a passenger or as a driver, your lawyer needs to act immediately to gather evidence and witness statements. Any delay will seriously impair the compensation you will be able to receive. Your lawyer’s job is to listen to you and provide advice on the right course of action for your case. He should be respectful and professional at all times. If you find him to be condescending, rude, or dismissive of your concerns, it’s probably time to choose a new lawyer. A great attorney-client relationship is just as important as the lawyer’s credentials and skills in winning your case. Remember that you are going to a legal war and you need a partner who understands you and will support you throughout the process. Your lawyer should be calm, rational, and objective when providing the legal assistance you need. One of the most obvious red flags when consulting with a lawyer is their reluctance to discuss fees. From the onset, you should be aware of roughly how much it would take for the lawyer to accept and conclude your case. This is essential especially if you are on a limited budget. Check all the bills and statements that you will receive from your lawyer. If you see an item that does not seem right or that you know nothing about, always ask for a clarification. If your lawyer cannot explain what it is, it’s probably time to start looking for other lawyers. When you find yourself confronting any kind of legal problem, a lawyer is always a good partner to have on your side. Your lawyer will safeguard your interests and ensure that none of your rights are infringed upon. Make sure that you take the time to research and find a lawyer that is reliable, skilled, and ethical. There are currently 1.34 million lawyers in the United States, but that doesn’t mean they’re all good. If you need a lawyer to defend you, whether you were wrongly accused of a crime or to help you settle a divorce, you want to make sure you hired a good one. Continue reading to learn of 5 telltale signs you hired a bad lawyer and how to avoid it in the future. When you hire a lawyer, you’re bound to have questions about your case. A good lawyer should always communicate what’s going on with your case, whether it’s about next steps or whose working on it. If you can’t seem to get a hold of your lawyer, especially after many phone calls and messages, that’s a bad sign. While lawyers get busy with other cases, they should always put their clients first. If you can’t reach your lawyer you should be able to reach the office or another staff member who can set up an appointment with you or a good time to reach them. Keep in mind that missed phone calls happen to the best of us, but your lawyer should never ignore you. Another thing to consider is how your attorney likes to communicate. In such a digital age, one lawyer may prefer email and texting while others stick to an old-fashioned phone call. The bottom line is, lawyer’s aren’t cheap. You’re not only paying them to help you with a case, but to communicate and give you their best service. If your lawyer isn’t communicating, you might consider switching to a new attorney. To avoid this in the future, ask your lawyer how the best way to reach them is during the consultation. This way you’ll know if they prefer email over phone calls and you can avoid any miscommunication. One of the biggest parts about being a lawyer is convincing the jury to go in your favor. If your attorney isn’t enthusiastic about your case or seems unsure, that should raise some red flags. But, another bad sign to watch out for is if they seem overconfident. While it’s good to be enthusiastic about a case outcome, their job is to be realistic and prepare you for any scenario which can occur. We mentioned it earlier and we’ll say it again – lawyers aren’t cheap. It’s not always their fault, it’s just the price of the service. But, if you hire a lawyer and you’re seeing excessive or overbilling charges, something’s wrong. You should never receive a bill with vague information. Each bill should clearly explain what the charge was for, who performed it, when, and for how long. Some law firms add surcharge fees to simple tasks or items such as postage or copying; these fees are unethical and inappropriate. If you see any billing fees that are unexplained and unclear, don’t be afraid to ask your lawyer what they’re for. Although some lawyers may have bad habits such as lack of communication, one of the biggest signs of a bad lawyer is if they practice unethically or even illegally. As important as it is to win your case, your lawyer should never do so by breaking the law or lying. Getting caught will not only look bad for your case, but both you and your lawyer could get charged with perjury with defense, also known as lying under oath. If your lawyer does one or any of these, it’s time to switch lawyers. Use this guide to help you through the process. Just as important as it is for your lawyer to get the job done, it’s equally as important for them to empathize with you and understand what you’re going through. Whether it’s a divorce case or a personal injury case, showing no compassion or empathy is a definite sign of a bad lawyer. The better they understand and empathize with you, the better they’ll be able to communicate that pain and suffering to an insurance company or jury if your case goes to trial. Although you may not love your lawyer, as long as they understand you and your case you’re in good hands. Like any job, some lawyers start out on the bottom and need to work their way to the top. Despite what online reviews say, if you notice a lack of respect for your lawyer in the courtroom or by other peers, it’s a red flag. Your lawyer needs to be respected and taken seriously, especially if your case goes to trial. If you don’t see a sign of respect from other peers, neither will the jury. Take the hint and find someone new. There are so many things to consider when hiring a lawyer, and once you’ve found one you have faith in and feel confident working with, it’s hard to see some of these telltale signs. If you notice any of these 6 signs, don’t be afraid to switch attorneys and start new. If you need legal help and want to avoid hiring a bad lawyer, check out our website. Contact us and we can help you find the perfect lawyer to help with your case.